But first, let me be transparent with my transgressions. I too rely on technology and electronic communication to reach goals, stay connected and keep up with the people who I love, like and am curious about. And just like you, I get distracted and overwhelmed sometimes. But, there are a solid list of things that I tend to focus on that make being respectful in the face of never-ending technology a bit easier to handle. Now brace yourself before you read this first one… Leave Your Phone Behind: Stay with me for a moment. I’m not saying to leave your phone at home or anything crazy like that, but instead to leave it at your desk or in the car or in your purse while you’re in an active conversation. I mean, what better way to not be distracted than to completely neutralize the distraction? 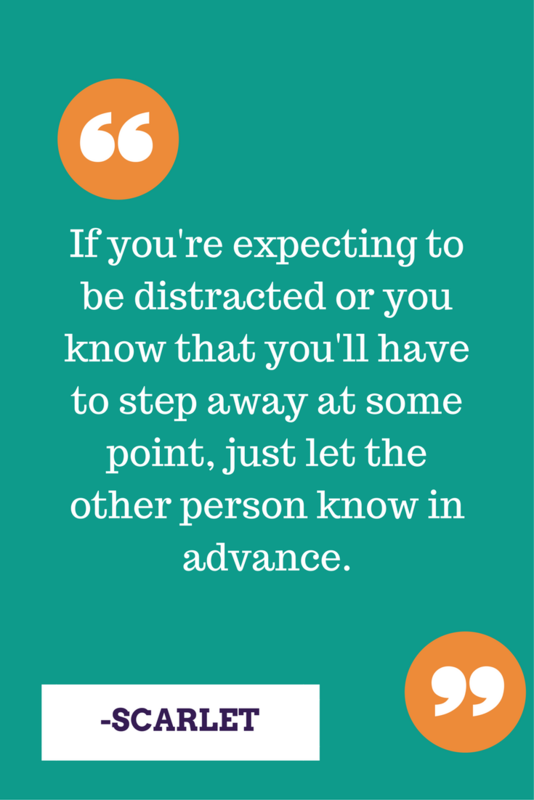 Give Them A Heads Up: Sometimes interruptions are unavoidable. If you expect to be interrupted or to be summoned away for a call or to respond to an electronic communication, just let the other person know in advance. Do You Really Need To Meet Up? 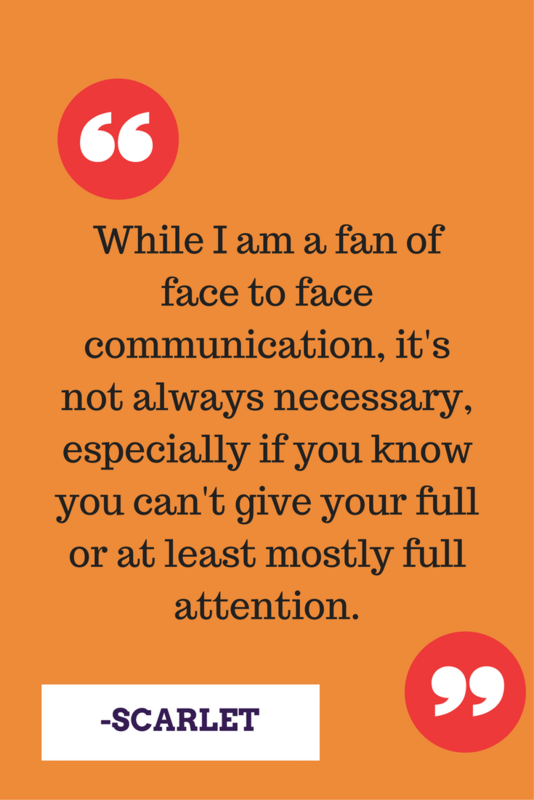 : While I am a fan of face to face communication, it’s not always necessary, especially if you know you can’t give your full or at least mostly full attention. Let’s Be Honest: While there may be some sensitive situations that we’re in, where keeping a phone nearby for emergencies is essential, the majority of the time it isn’t. Your phone and all of its associated messages will be there when you pick it back up again. Life Is Short: Connect with the people you love, like and have interest in, in person, while you still have the time. Scarlet Says…There is nothing wrong with staying in the know and taking advantage of the perks of social networking, texting, email and other electronic communication. Just remember to be mindful of the options you have to eliminate distractions and the value you create for yourself and your relationships when you do.